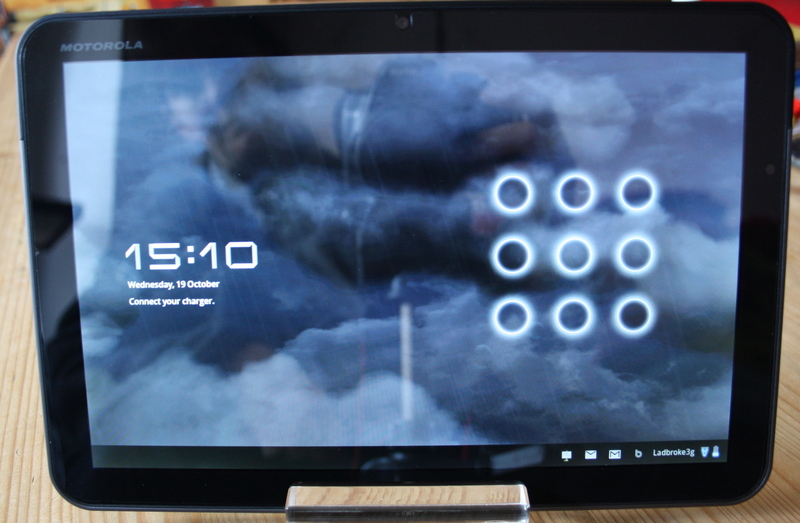 Here I am again but this time with a little review of my newest gadget. 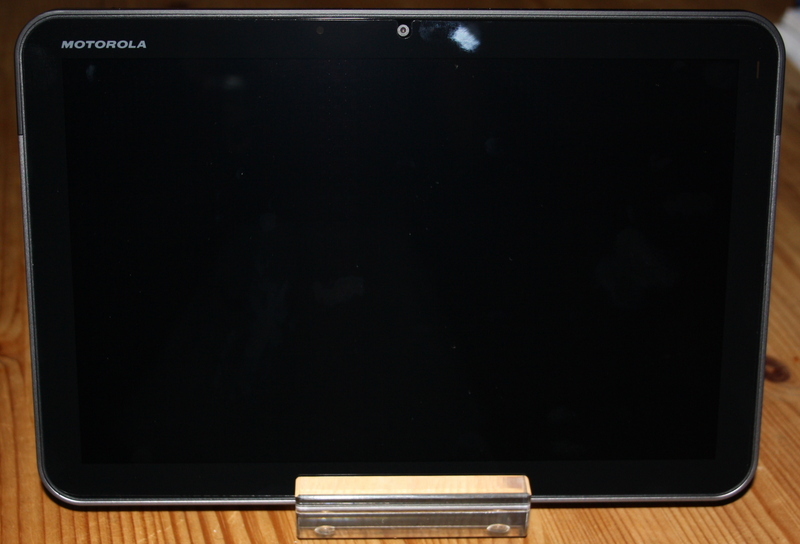 As some of you might know, I’m an Audio Editor and need a tablet to read the script while editing. Till 2 days ago I had my most beloved Samsung Galaxy tab for this job. I always love especially the size of it which made it so handy for all sorts of things…the only downside was reading scripts on it. I always had to adjust the size of the pages which made it difficult because you had to do it every time the page changed. Well, since Neil had the ‘horrible’ (just joking) idea to have a nice drive around to pop down to B&Q, Toy’s r Us and Best Buy. So we ended up in our most loved (hated) Electronic Store in the area: Best Buy and took a look around the available tablets. 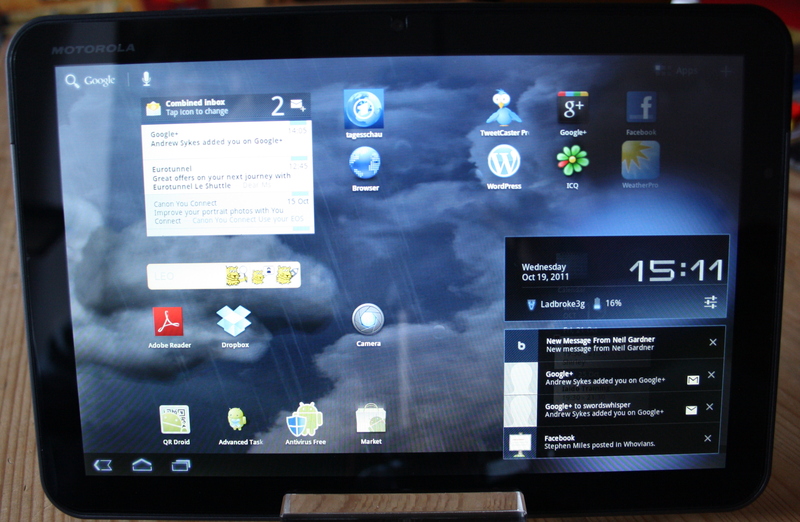 I really liked the new Samsung Galaxy 10.1 but from my point of view it was with £399 still too expensive. 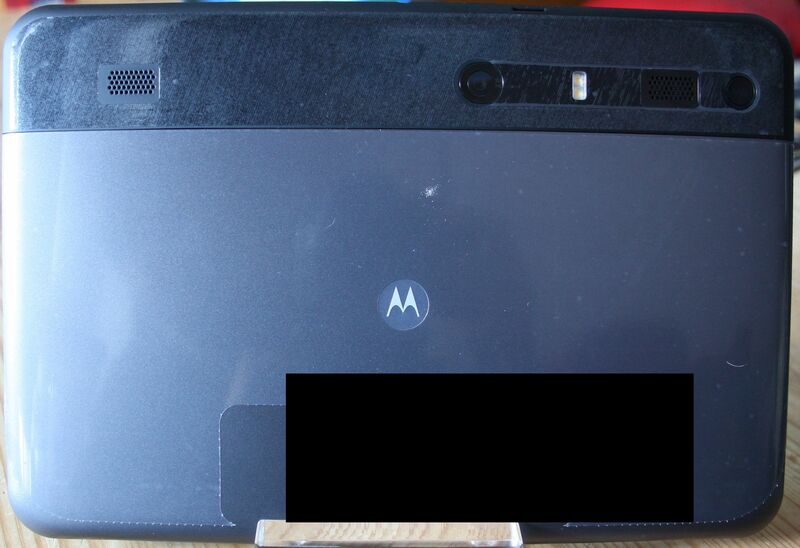 So I took another look around and found the Motorola Xoom for only £330 with much more power and also 32 GB RAM, double as much as the Samsung. After Neil had a little play with it as well, he decided that it would be a good thing to have this one for our new business instead of the Galaxy. So this gorgeous new friend found a new home in Hokusbloke HQ. I must say, that it is very light (it feels lighter then the iPad 2) which makes it a lot easier to hold in your hand without getting any aches. I especially like the way how you can lock your device with this little program were you decide in which way it unlocks the tablet. And this is my home screen. Of course you can organize it the way you like it. This is the multi-tasking view where you can see all the programs that are running at the moment. (there is also a nice app to kill all those with just one click..more about that later). Here you can see the overview about your notifications which you can open by tapping on the clock in the right bottom corner. There you find all your notifications like: emails, G+, tweets, basically all the stuff from your apps that are allowed to notify you. You also have a little shortcut under the clock to get direct to a mini version of the full settings menu, like the pull-down bar that you have on your Android. 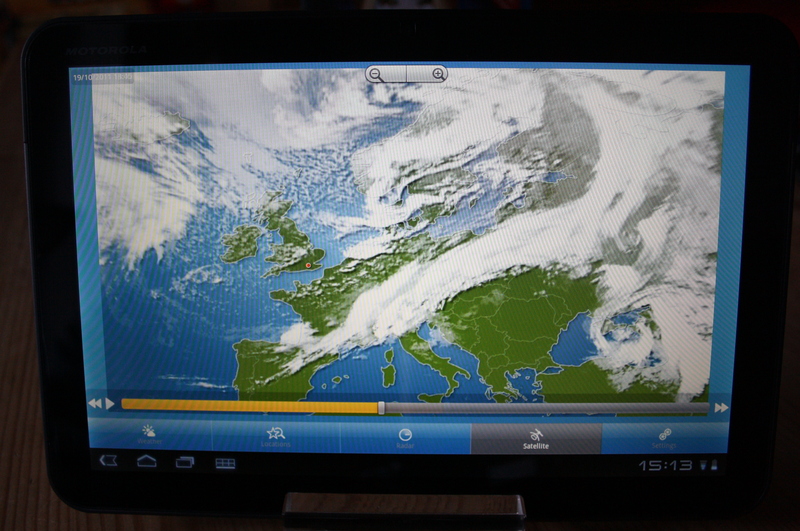 And because I am a weather geek, I also have to have my all time favourite App on the Xoom again: WeatherPro. 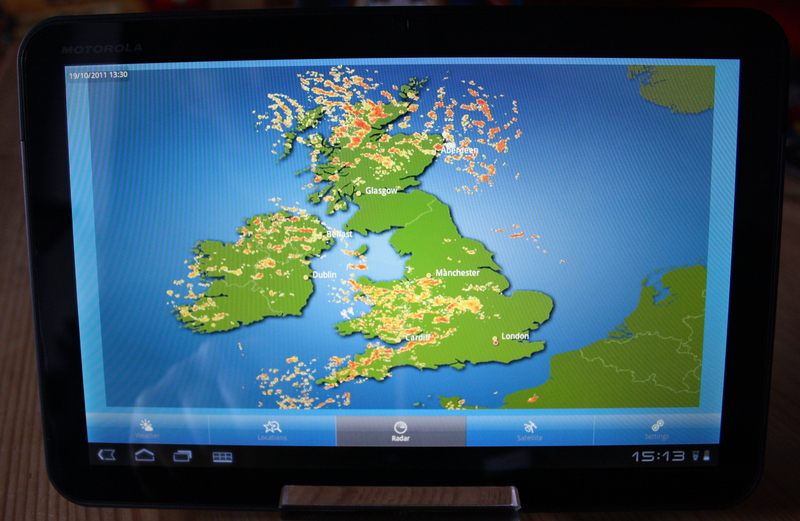 For me THE best weather forecast app on the market. The guys from MeteoGroup are also on twitter and facebook and if you have any questions they reply quite quickly. (well, at least the German gang is always up for a quick tweet or reply on facebook). 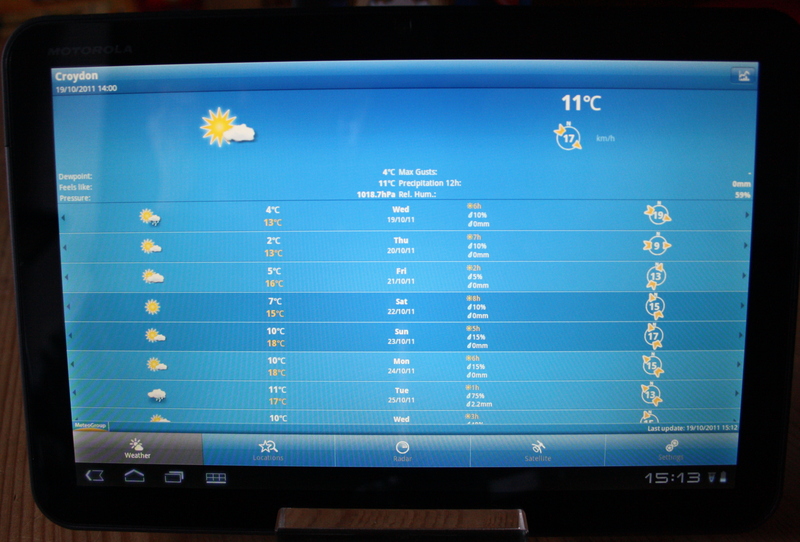 1st: the overview of the weather of a location you have chosen before. You can find even more details about the daily weather by clicking on the symbols on the left & right side. 2nd: Here you get the satellite images and 3rd the radar view for the oncoming rain. 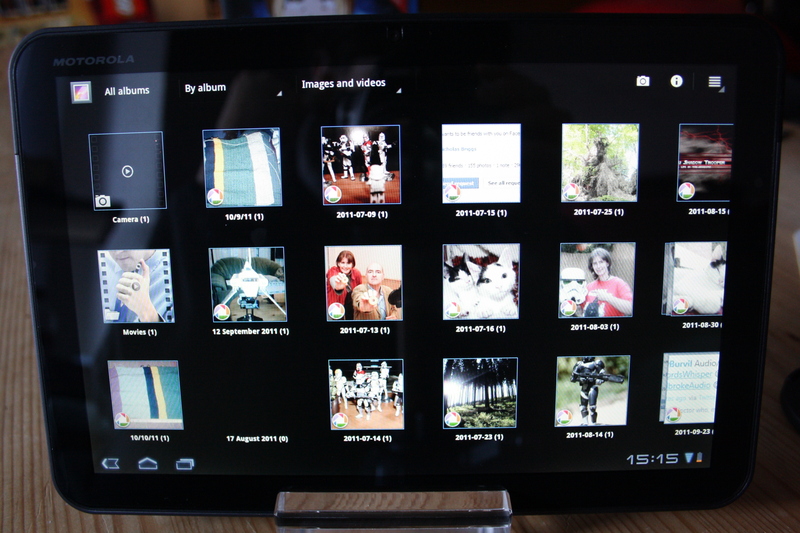 And this is how the picture overview looks like. All the pictures you have taken with your camera will show up here. 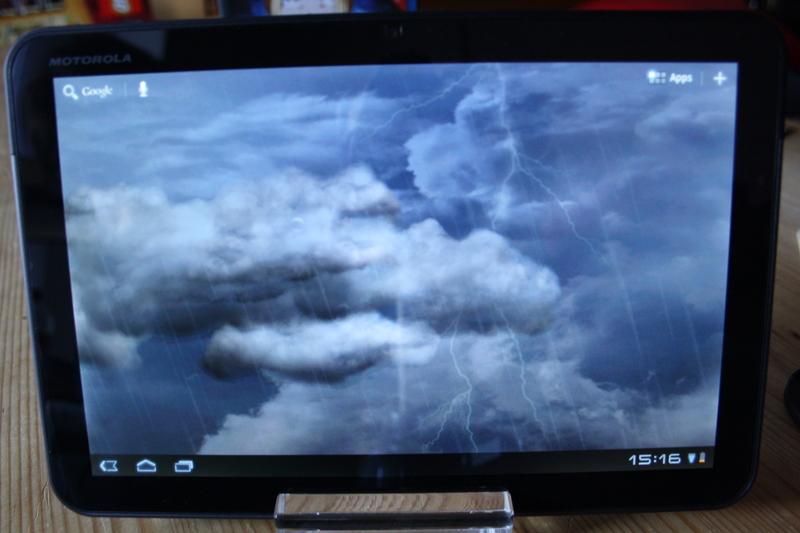 And since one of the most brilliant features about an Android is the live wallpaper, I just wanted to show you my favourite one: Thunderstorm. You can get it for free or pay the full version which allows you to make more changes. So, all in all I really love my new gadget. It is faster, I can stream easily my favourite Animes on Crunchyroll even with a low WiFi signal. And yes, the Animes there are free and also is the program. You just have to ignore the advert at the start of every episode you want to watch. 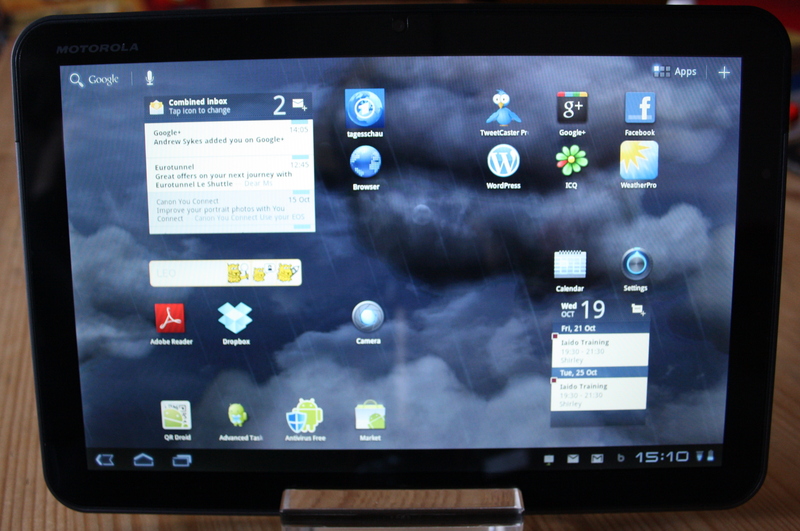 Haven’t tried any movie files yet but as many people online say, I don’t think that it will be any problem since the Xoom has a lot more power then my Galaxy. There is just one more App I really think you should have to kill running programs Advance Task Killer. It is free and really does the job – it kills everything (you have ticked…oh…that sadly doesn’t apply for annoying co-workers, your boss 0r the noisy neighbours). I just wish that Kaspersky’s Internet Security for the Android wouldn’t be so expensive. 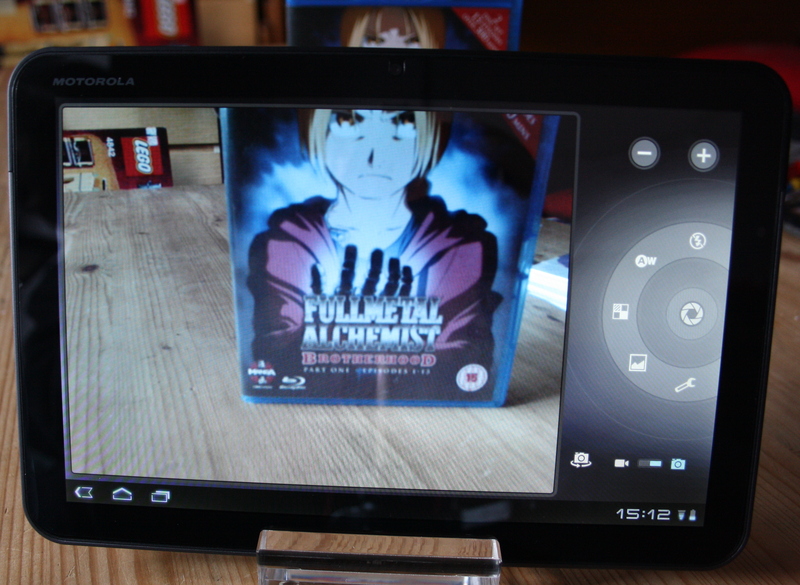 I really love their prog and would love to have it on the Xoom as well….but not for something around £7. 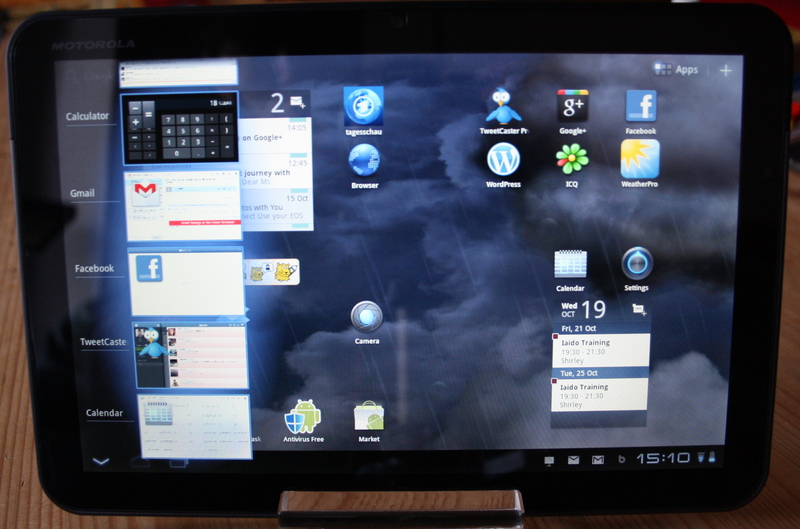 So, if you like gadgets, tablets and Androids…then forget about the iPad and join me on the dark side! Androids are cool! Em, well…not sure what my overall message of this post is….maybe…I love my new gadget and it is faster then the Galaxy tab and better then the iPad 2 because it’s an Android?! This entry was posted in Uncategorized and tagged Advanced Task Killer, Android, App, Apple, Best Buy, Gadget, Galaxy tab, iPad 2, MeteoGroup, Motorola Xoom, Samsung, tablet, Thunderstorm, WeatherPro. Bookmark the permalink.